Hopefully you have spent some time outdoors admiring the wonders of nature. Being a Honey Bee enthusiast, the sighting of the Apis Mellifera, Honey Bee, often becomes mesmerizing. Yet, of late the number of Native Bees flirting about flowers has increased the excitement and enjoyment of some of nature’s wonders. The Bumble Bee, Bombus, has proliferated our forage this season. There are 16 species of native bumblebees in the Pacific Northwest with over 250 different ones in the group. Much like the Honey Bee, the bumblebee is considered a eusocial insect, as they live in colonies with a singular queen. The colonies are less than 100 in population, more often lessor amounts. The Bumble Bee belongs to the insect order Hymenoptera which includes the bees, ants, wasps and sawflies. They are similar to their close relative, the honey bee, with a slight exception. Honey bee queens live from two to five years, while the bumble bee queen only survives through one winter. The Bumble Bee Lifecyle begins in the spring when mated overwintered queens emerge from hibernation to gather pollen and nectar in support of their newfound colony. Willows, rhododendrons, ephemeral spring wildflowers become the source of this early activity. The queen searches for a nesting site, often abandoned rodent dens, open grass tussocks, hollow logs, and above ground manmade structures. Once located, the queen begins to lay female eggs supported by pollen and nectar. It is not until mid-summer the queen lays males for the fertilization of the females. These fertilized females then venture off to locate a winter spot for their winter hibernation. Each species of bumble bee pollinates a different set of plants. Some have longer tongues, proboscis, allowing them to pollinate longer tubed flowers. Tomatoes, along with other vegetables, fruit trees and vines, and flowers are pollinated by the bumble bee. 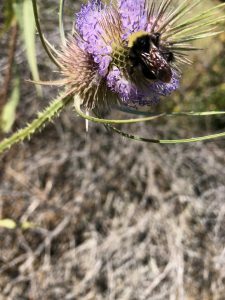 Lupine, mint, larkspur, aster, clover, salmonberry, Oregon grape, salal, huckleberry, madrone and rhododendrons are also important native plants for the Pacific Northwest bumble bee. The foraging distance can be as far as six miles, but since their survival is dependent on the small amount of nectar and pollen capable of being stored in the hive, the flight distance is most likely much shorter. A special aspect of the bee is their ability to buzz pollination (also known as sonication), where they rapidly contract their indirect flight muscles. The flight muscles are not directly attached to the wings but rather to the exoskeleton which then articulates the wings, much like the honey bee. Sonication produces strong vibrations that forcibly expel pollen out from inside the flower’s anthers. While sonicating, bees can generate forces of up to 30 G! To pollinate some plants, such as blueberries, cranberries, tomatoes, and kiwi, bees “wrap their legs around the flower” and buzz a middle C note, causing release of pollen “like salt from a shaker”. Since the bumblebee is such a prolific pollinator they are used in commercial greenhouses extensively in support of peppers, cucumbers and tomatoes. Not all bumblebee species are in decline. Some have increased in numbers. As mankind increases our footprint on the open space, there becomes a natural decline in the bumblebee. This is especially evident in the cities. Bumblebees can be affected when pesticides are sprayed directly on nesting sites or near foraging sites. This becomes an acute exposure rather than a low-dose long term one. 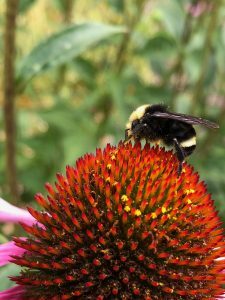 Bumblebees are more prone to disease while in captivity, and may spread these pathogens to other native bees should they escape captivity from their greenhouses. This phenomenon is known as pathogen spillover. Introduction of exotic and invasive species also causes diminishing populations. These species compete with habitat the bees were accustomed to foraging within. Examples include the Wool Carter Bee, Giant Resin Bee, and the Alfalfa Leafcutter Bee. Unfortunately, some nests have been destroyed by humans as they are perceived to be a danger through their stings. The bumblebee, unlike the honey bee, is capable of multiple stings but rarely are aggressive if left to their own. 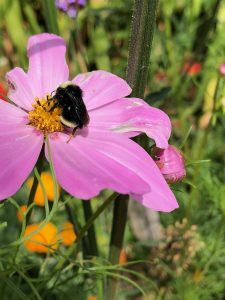 How can you help in preserving the bumblebee? 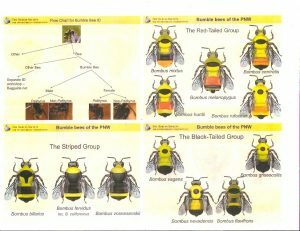 •	Keep an eye out, reporting sightings to the – Xerces Society – or – Bumble Bee Watch – where photos may be uploaded for expert identification. •	Provide food and shelter for bumble bees in gardens and fields by planting pollen rich and nectar plants. •	Leave bumble bee colonies alone if you find any. Wait until winter to seal up the entrance as the males and queens will have exited.